WASHINGTON - President-elect Barack Obama yesterday unveiled the latest element of his plan to rebuild the nation's battered economy, vowing that his team would comb through a federal budget that "bleeds billions of taxpayer dollars on programs that have outlived their usefulness" and end those that "exist solely because of the power of politicians, lobbyists, or interest groups." At the same time, Obama said he is pursuing a "two-fer" strategy under which some of his campaign promises, such as tax cuts for most working Americans, would be reworked into a massive package to jump-start the economy and create or save 2.5 million jobs by 2011. Another example of an initiative that would provide a short-term boost and lay the groundwork for long-term growth, he said, would be medical technology, such as electronic record-keeping, that would create jobs and provide business for computer companies now, then make healthcare more efficient in the long term. His office also announced yesterday that Obama and Vice President-elect Joe Biden will meet next Tuesday with 40 governors and governors-elect to discuss the economic crisis and strategies for recovery. While Obama repeatedly has said he would go over the budget line by line, his options are limited. Only about 20 percent of the federal budget is considered "discretionary" spending, with the rest devoted to defense and entitlement programs such as Social Security. Most of the discretionary funds are politically popular and go to an array of agencies, such as the Department of Transportation. Obama offered only one example of the kind of spending he wants to end. He cited a government report yesterday that said farmers earning more than $2.5 million annually have collected $49 million in federal subsidies over a three-year period. "If it's true, it is a prime example of the kind of waste that I intend to end as president," Obama said at a Chicago news conference. However, such savings are relatively small compared to a stimulus program that might cost as much as $700 billion over two years. Moreover, while it may be relatively easy to cut benefits to the wealthiest farmers, it is bound to be more difficult to eliminate entire programs that benefit a broad range of constituents. For example, Obama has been a major backer of federal subsidies for ethanol, which benefit his home state of Illinois but have been criticized by some taxpayer watchdog groups. Steve Ellis, a spokesman for the nonpartisan Taxpayers for Common Sense, said it will be difficult for Obama to make significant cuts in the federal budget "unless he makes really big vertical slices in whole programs. These programs are there because they have constituencies, and he would have to expend a substantial amount of political capital to get the cuts through." Obama said that Peter Orszag, the director of the Congressional Budget Office whom he named yesterday to be his budget director, is just the man to perform that task because he "knows where the bodies are buried in the federal budget." Obama also named Robert Nabors, staff director of the House Appropriations Committee, as deputy budget director. But Ellis said that while Orszag is expert on the impact of the Bush tax cuts and the need to restructure Social Security and Medicare, "spending cuts have not been a hallmark of his career." Still, acknowledging the red ink he will face, Obama vowed to follow through. The federal deficit, $455 billion for the fiscal year that ended Sept. 30, could exceed $1 trillion in fiscal 2009. "If we are going to make the investments we need, we also have to be willing to shed the spending that we don't need," he said. "In these challenging times, when we're facing both rising deficits and a shrinking economy, budget reform is not an option. It's a necessity." With 56 days until he becomes president, Obama has urged that Congress pass a stimulus bill soon after it convenes on Jan. 6 and seek to have the measure ready for his signature when he becomes president on Jan. 20. But Republicans signaled yesterday that they may put up a fight. House GOP Leader John Boehner of Ohio said yesterday that while Obama's economic team is experienced and qualified, "Americans simply do not believe more government spending will get our economy moving again." Boehner instead proposed a series of tax cuts, including revoking the capital gains tax on newly acquired assets for the next two years, doubling the child tax credit for working families to $2,000, slicing corporate tax rates, and providing incentives for energy development. Democrats will enter the next Congress with significant majorities, but it is not clear whether they will have enough votes - 60 - to stop Republican filibuster attempts in the Senate. The next Senate will have at least 56 Democrats, as well as two independents who caucus with the Democrats, with contests undecided in Minnesota and Georgia. 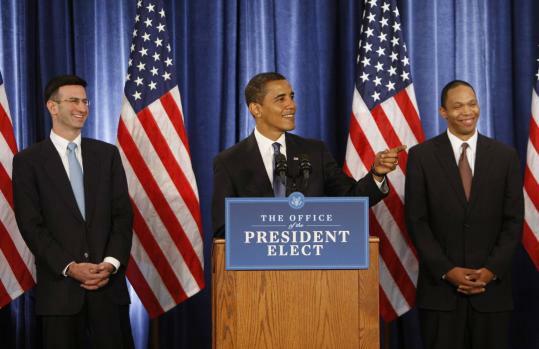 Obama signaled he wants to work closely with Republicans, but also noted that he won 53 percent of the popular vote. "I don't think that there's any question that we have a mandate to move the country in a new direction and not continue the same old practices that have gotten us into the fix that we're in," he said, while pledging to serve with "a sense of humility and a recognition that wisdom is not the monopoly of any one party." "What the American people want more than anything is just common-sense, smart government," Obama said. "They don't want ideology; they don't want bickering; they don't want sniping."